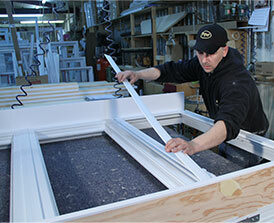 Préville Vision Confort Windows and doors manufacturer since 1960! Préville Vision Confort is a family business specialized in the custom manufacturing of PVC windows, steel doors and patio doors since 1960. 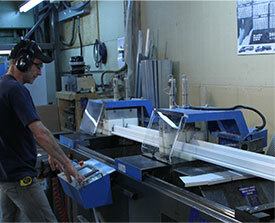 Our vision is based on proactiveness and the development of a long-term relationship with our customers and partners. Since our very beginnings, our growth has constantly kept pace with technological advances in windows and doors manufacturing materials and equipment. For the future, Préville Vision Confort will continue to deploy following the evolution of the window and door market and over the requests of our customers whose satisfaction is important to us. From the manufacturing to the installation of your windows and doors, Préville has the experience and expertise necessary to assist owners and contractors in their most ambitious projects and meet their high requirements. Thanks to our production capacity in our plant and to our close collaboration with renowned partners, we can offer our customers the best windows and doors products currently available on the market. Contact our representatives today to get a free quote. 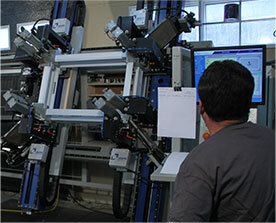 Want to reproduce a specific colour, or to be inspired by the latest trends in window and door colours? With Préville Vision Confort, the only limit is your imagination! From brighter to darker shades, Préville offers you a palette of window and door colours to create the desired effect. Call on our specialists. We will make every effort to ensure that your vision becomes a reality. 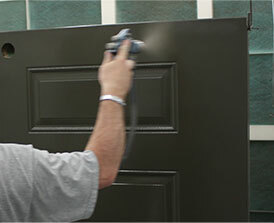 Surface preparation, paint application and drying: our experienced technicians carefully follow each step leading to perfect colouring of your windows and doors. 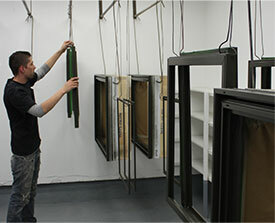 With our 4 paint chambers and a drying oven, our facilities have all the equipment required to carry out a professional job and ensure a large production capacity.